It’s a Flask, It’s a Vegetable, It’s Bottle Gourd! Guess what I found when I was in New York’s Chinatown last week. This beautiful looking hulu! I’ve not seen them before in New York nor anywhere in the U.S. Hulu (葫蘆) is a bottle shaped gourd often seen in Chinese brush paintings. Sages or monks carrying hulu flask are common themes in Chinese art. But these sinuous shaped gourds are also delicious as vegetables. Mature hulu gourds form rigid and durable shells. When dried and hollowed they make excellent containers. For thousands of years the Chinese used these gourds as bottles to carry water or wine, or as ladles when cut into halves. Hulu bottle decoration is a folk art that is still practiced in many parts of China even now. They are painted with brush and ink, or branded with hot iron. And some artists carve decorations or prosperity symbols on the hulus. Many of these pieces are considered fine artworks. Museums and collectors alike covet them. 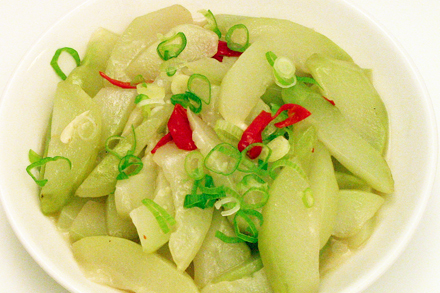 The young tender gourds on the other hand are commonly used as a vegetable. They are tender and have a mild summer squash-like flavor, making them an excellent ingredient to accompany stronger flavored food. Hulu is a very flexible ingredient that can be stir-fried, stewed or used in soups. I often enjoy a simple stir-fry of hulu with a bit of garlic and salt. But a few years ago I was in a Xinjiang restaurant in Shanghai and I tried this stir-fried hulu with a vinegar sauce. I thought the vinegar gave the stir-fry a very nice kick. So today I’m sharing my version of this dish with you. When selecting hulu make sure to buy one that is green and tender. The skin of the gourds should be crisp but not tough. I usually like to cut the neck of the gourd off first before peeling with a regular potato peeler. It is much easier to peel the two halves separately. (If you’re unable to obtain hulu you can use this recipe with summer squashes instead.) The vinegar I like to use for this dish is Chinese white rice vinegar. It has a very nice mild flavor. Get a medium size hulu of about 1 1/2 pounds. Peel and cut open the round bottom of the gourd. Scoop out the seeds and pith. (The seeds are actually very tender but I like to scoop them out so I can cut up uniform pieces to cook evenly.) Cut the halves further into quarters lengthwise then cut them into slices about 1/4 inch thick. In a wok heat the vegetable oil on high until just about smoking. Add the garlic and stir-fry for about 30 seconds. Add the hulu slices and water then cover. Turn the heat down and simmer for about 5 minutes. Check the liquid occasionally to make sure the hulu slices don’t burn. When the hulu is tender, but still green in color, add the salt, vinegar, cooking wine, sugar and chili if used. Simmer for another one or two minutes. Add the cornstarch slurry and stir-fry until the sauce is thickened. Serve hot garnished with thinly sliced scallion. I’ve never seen these fresh let alone eaten any. My parents have some painted as decorations in their home. 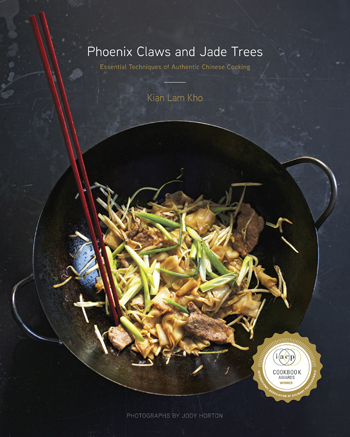 I’ll have to go to chinatown and see if I can find any, you dish looks delicious. It’s a great-looking vegetable, these gourds. Almost too pretty to eat. I’ll have to try this vinegar sauce: it sounds delicious! I am always amazed at the variety of produce and food products now available in the U.S. from China. I discover new things every time I go to Chinatown. I love the way these look, and I’m so intrigued to try them, especially with your recipe. Luckily, my new Brooklyn home is only a few stops from Chinatown! Secondary, I have never seen the bottle gourd, but have seen the similar green gourd (cucuzza in Italian), same green color but often just a long cylinder. (http://www.cucuzzasquash.com/) Do they taste similar? I’ve seen the same squash at the asian markets only shorter and squatter, so maybe you’re familiar? You think I could sub it out, after peeling them first? I have never eaten this, I always thought it was use as storage or decoration when dried out. Cool. I will have to tell my parents because they have some hulu growing in their gardens in Texas. Do you know if they have another English name? I want to try your vinegar sauce recipe! Diana, I don’t know of any other English name for this gourd. 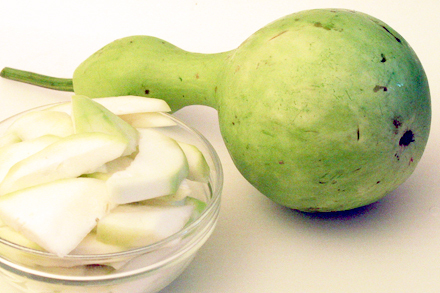 I believe bottle gourd is the most common English name. I had no idea you could eat these! The stir-fry sounds delicious with the touch of vinegar. 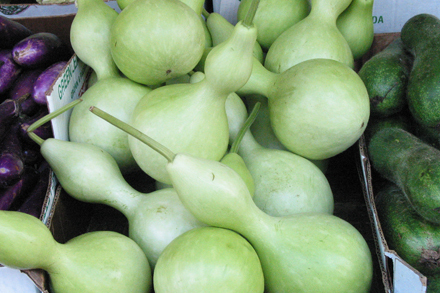 They also go by the name of gooseneck gourd. I have vines of bottle gourd growing in my yard now. I planted them to cover and shade my dog’s kennel and also to create a cool play spot for my son. The vines seem determined to take over the entire world!! They have small fruits hanging from them and many more are on the way. As there is not enough time left for them to get mature enough to harden into containers I should just eat them, and am eager to do so. I don’t know when (what size) to pick them for cooking. I suppose I have enough available to just use the trial and error method but if anyone can help me with some hard info I would appreciate it. BTW this variety was described on the seed packet as Giant Bottle Gourd, in case that’s important. I also have vines of long handled dipper gourds and Upo (or Opo)that are blooming male flowers but no fruits yet. Obviously I need more recipes. Some asian friends in the east Dallas area would come in handy right now to help consume this bounty! I just cooked this today using your recipe. It doesn’t look quite as nice as yours but it tastes great! Thanks for sharing your recipe. Hi there, does anyone knows where I can get this vegetable in malaysia as I need it very urgently? I do hope I get a reply back as soon as possible. Thanks and please answer me! Can anyone help Amy find “hulu” in Malaysia?